The OD's assault on Utica continues . . . Yet for a good half-century, too many Uticans have wallowed in negativity, repeating like a mantra a series of truths, half-truths and mistruths that remain detrimental to the city’s image. You’ve heard them all. It was a mob town. . . .
Who has a fixation on Utica's mob past? Certainly not the people living in Utica, most of whom were not even born when those things happened. Certainly not the new immigrants . . . Oh, I know . . . It is the local newspaper that periodically dredges up 50-year-old mob stories on the thinnest pretext . . .
Cities that have barely half their former population need to downsize — getting rid of empty but once-beloved eyesores and corralling growth and commerce into areas where services are easy to provide. If mean that, OD, then lets bulldoze Sangertown Mall which is showing signs of age and "corral" retail back into Utica where the services have always been easy to provide. And lets bulldoze that arterial too . . . That way we could "corral" Uticans into shopping in their own city. But, of course, you don't mean that, OD . . . That would require your suburban friends to give up some things. Just how does the OD expect Utica to pay for the corralling? And what about the infrastructure already in place? Should we throw it away (while extending more infrastructure into New Hartford)? And what about the loss to Utica's tax base that will occur? Is New Hartford offering to make up for the lost tax base? The OD would have Utica dig its own grave before forcing it to jump in and burying it. When your family grows and relocates, it’s still family. Until we embrace a more regional attitude, we’ll continue to sputter in our own little corners. Why is every OD directive to Utica coupled with a "regional attitude" theme? Utica has done more than embrace the regional attitude. It ponied up with money and assets. It gave the suburbs its water system, its sewer system, and paid half the acquisition costs of land for the road that gets people there. Utica residents in their water and sewer rates still subsidize the cost of the extra miles of water and sewer pipes needed to transport water and wastewater to and from the suburbs because the authorities insist that everyone must pay the same rates. Uticans even pay to pump water uphill to allow development on the hills in New Hartford ... but New Hartfordans don't pay more. Why is that? Uticans paid for half of the study to solve the sewer consent order problem -- a problem created by suburban development -- and will pay for a quarter of the 180 million dollar solution. For years and years, well-heeled people who could well afford to pay Utica taxes took advantage of Utica's offerings but escaped paying by moving across the municipal line. That forced the fewer people left behind to pay more -- and made Utica less affordable to newcomers. If we really are a "family," then the spoiled bratty suburban kids need to grow up and stop hitting grandma up for more while she lies on her deathbed. The suburbs need to share what they have. A Regional Attitude is NOT lacking in Utica. It's lacking in the suburbs. . . . and in the editorial board of the Observer-Dispatch. YOU Are a Commodity . . .
You are state property . . . At least that is the way some law makers think of you. People who die without a will or trust have their personal property distributed according to the State's laws . . . but it always goes to family members if they exist. Here, however, your kidney may be given by the government to a stranger. Such proposals (besides raising creepy thoughts of government agents running off with your liver or heart before your body is even cold and trafficking in them) reinforce the idea that we are subjects of the government . . . of the elite controlling our government . . . that we owe our lives to them . . . rather than the government deriving its power from and being the servant of the people. Our leaders wonder why people leave New York! The idea that the government can just come in and take has to go. Much is being made in the press of an alleged 1982 Memorandum of Understanding between the Town and Village of New Hartford when their police forces were consolidated . . . that maintenance of the Police Commission was allegedly a condition of the merger. Why have we not seen this memorandum if it is so important . . . if it even exists? . . . if it ever was executed? Let's Bulldoze Utica . . .
Is that what the Observer-Dispatch was hoping for when it wrote its sidebar "Smaller, Greener, Healthier?" to Sunday's article Cornell project’s goal: Help revive Utica ? That would be consistent with its elation at the impending destruction of Bagg's Square back on 10/16/1968. The idea of "downsizing" Utica by demolishing neighborhoods is idiotic. While it may sound logical to to bulldoze neighborhoods and move the people to other neighborhoods to create an affordable increased population density, this isn't Soviet Russia or Beijing (not yet anyway). It will not work. We've already tried this sort of experimentation in the 1960s to improve things but it only made Utica's economic climate worse. It was called Urban Renewal or Arterial Highways. Both types of projects involved massive bulldozing of entire sections of the city (which took generations to develop). While local media and cognoscenti promoted these projects history proved that they hadn't a clue. Once displaced, if people did not leave the area entirely they set up shop in New Hartford. That necessitated creation of more infrastructure in New Hartford (increasing taxes there), and decreasing tax base and wasting the infrastructure in Utica (increasing taxes there). . . . The "downsizing" idea will produce more of the same: a Lose-Lose proposition. If we don't learn from our own history we will keep repeating our mistakes. Washington Post: Arcuri Days Numbered? In Upstate New York, Democrats feel betrayed by Rep. Arcuri . . .
And Rep. Michael Arcuri, the first Democrat to represent this area in the House since 1983, has become one of Congress's most vulnerable Democrats, unpopular not only with conservatives but with many of the activists who helped him get elected. . . .
Like Democrats elected recently in similar districts, Arcuri has tried to please both his base and his crossover supporters. Shortly after taking office, he joined the fiscally conservative Blue Dog Coalition. He voted in favor of the stimulus but against a "cap and trade" bill aimed at reducing greenhouse gas emissions. Then last month, he reversed course on the health-care bill, voting against it along with 33 of his Democratic colleagues after supporting it for months. Mr. Arcuri has been caught between a rock and a hard place. Had he voted upon his principles, he would have voted for the health-care bill . . . and against the wishes of most of his constituents. That would have put his position in jeopardy. Now he has voted with his constituents, but against his principles, upsetting the activists who got out the vote for him in the first place. That puts his position in jeopardy. "We certainly appreciate the hard work that activists do, but I represent a largely moderate district and voted the way the district and I thought was best," Arcuri said in an e-mail. On his Web site, he said he was concerned that insurance premiums would rise for families, seniors and small businesses. Mr. Arcuri's assessment of his situation is correct, of course. But being correct does not win elections. Being representative of the electorate does. In this Internet age nothing goes unnoticed forever. People find out if their representative's views really match their own. Why would anyone vote for a candidate who votes their way when watched, but who might act in a different way when not? If Mr. Arcuri loses the next election, it will not be because he voted wrongly on any particular issue. It will be because his viewpoint -- his belief system -- no longer represents that of the majority of voters in his district. Members of Congress are called "representatives" for a reason.
. . . and now, a Public Service Announcement . . .
Tomorrow/Thursday is Earth Day . 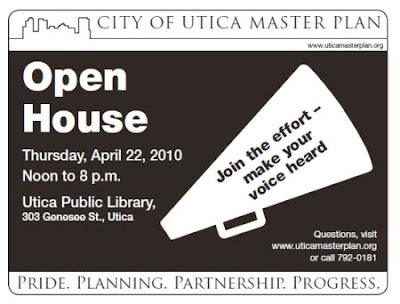 . . and the Day that the Utica Master Plan Steering Committee holds an Open House at the Utica Public Library. They've been busy on this for over a year, but a lot of people don't know what the Committee has been doing, or even what a Master Plan is! NOW is your chance to find out! There will be displays describing what a Master Plan is, the process to develop it, and and the goals and objectives that have been determined thus far. Please attend this event, look at the displays and register your feedback. It's YOUR CITY . . . It's YOUR FUTURE. High Speed Rail: Numbers Please . . . Here we go again. The High Speed Rail (HSR) train is leaving the station ... and it should just go and maybe make way for something else. “High speed rail represents the Erie Canal-like vision that can rebuild the Upstate New York economy,” said Arcuri. “It was really an honor to be able to join local business, labor and government leaders to discuss how further investment in this cutting edge transportation infrastructure would create jobs and lead to future business development opportunities in our region with someone as influential and knowledgeable about rail as Chairwoman Brown. Knowledgeable people are not buying this hype . . . and that is about all that this is. "Erie Canal-like vision?" Hardly. The Erie Canal was a game changer for Upstate New York in the 1800s because it (1) substantially increased the speed and (2) significantly reduced the cost of transportation between places where people/goods needed to go. 150 MPH, if HSR will even do that, is NOT a substantial improvement in speed over interstate highways when time to get to and from the station is taken into account. Cost? No one is even mentioning reduced costs here, probably because costs will be greater! "Cutting edge transportation infrastructure?" Wrong. The bullet trains of Japan have been running for almost 50 years . . . and HSR here isn't supposed to be as fast. "Create jobs?" Perhaps to build the thing. But if we're building something that is already old-fashioned and few will want or use, why bother . . . why not just give the money away to people? "Lead to future business development opportunities?" How about some examples of the types of opportunities that HSR will create, so we can judge for ourselves whether or not this makes sense? "Someone as influential and knowledgeable about rail as Chairwoman Brown?" What knowledge? Perhaps if she shared some of it with the public maybe we would be influenced too. Redistributing the "Wealth" . . .
And where did the "Industrial Incentive Award program" get its funds from? Our electric rates (among the highest in the country)! And where did the Power Authority get its power to do this from? Our State Government.. While I suppose we should be happy that a local firm is getting a grant to keep local jobs in place, what about all the other businesses who are struggling to pay NY's outrageous electric bills (becoming more outrageous as former Gov Patacki's "Regional Greenhouse Gas Initiative" "cap-and-tax" scheme kicks into high gear)? What about US . . . and our own residential electric bills? The question that needs to be answered: Why are Upstate NY's electric rates so much higher than other states who compete with us for jobs? Especially so with all the hydropower we have on our door steps . . . If you are a regular reader of Fault Lines, you know the answer to that question. When we have to "redistribute the wealth" from working families to make electricity affordable for the businesses who employ them, can economic collapse be far behind? Utica not paid for St. Luke's fire calls reads the headline. New Hartford police patrol the St. Luke's campus of Faxton-St. Luke's Healthcare. The hospital is projected to pay the town $23,000 this year for the service. The Utica Fire Department responds to alarms, fires and hazmat calls at the St. Luke's campus -- 37 times in 2009, according to city records. The city was paid nothing. . . .
A “gentleman's agreement” between the city and Faxton-St. Luke's Healthcare calls for first-responder fire service to be provided free to the hospital's New Hartford campus. Now, it's coming under scrutiny recently as the city seeks additional sources of revenue. If St. Lukes needs Utica Fire protection, why did it remain in New Hartford? The Faxton-St Lukes complex contains one of the biggest buildings in the area. It makes sense for Utica to continue handling fire protection since Utica already has the equipment to serve several other comparable complexes. Why should New York Mills residents, or the residents of one of our other nearby villages, have to pay to maintain the hook and ladder and other equipment necessary to service such a large facility? And why should Town of New Hartford taxpayers have to pay one of the nearby villages when service is needed? And Why would New Hartford want to have this facility within its borders? It brings in no tax revenue. The money paid to the Town Police is buying a private security service that Town taxpayers actually subsidize. That practice needs to end. If anyone gives birth there, or dies there, people have to trek to Butler Hall for the birth and death certificates. The revenues for the certificates go to the Town of New Hartford, but the volume is likely much larger that what Town residents would generate and probably requires Town taxpayers to maintain an additional deputy clerk to issue paperwork for non residents. Why should Town taxpayers pay for an additional position to issue the paperwork for the non-residents? There are probably more Uticans in that hospital and the St. Luke's home than people from any other local municipality. Many own property in Utica. They should be counted as Uticans in the census, so that proper state and federal funding gets routed to Utica take care of their costs to the City. They impose no costs on New Hartford. The Masonic Home saw the value of annexing itself to Utica. Faxton-St. Lukes Healthcare should consider doing likewise. The Town could then eliminate a deputy clerk and the cost of sending police patrols into the area. The Hospital could avoid having to pay a separate charge for fire protection. Utica would receive increased revenue from the birth and death certificates, and increased state and federal revenue related to an increased population count -- which could be used to offset the cost of fire protection. And people needing vital records could conveniently get them from centrally located Utica City Hall, rather than Butler Hall. Annexation sounds like a win win win win. Let's Not Forget the 116th District . . .
Greg Johnson, a Marcy town councilman, said he’s running to represent the values of the people in this region and to create an environment for better job growth. What skills would he bring to the desired seat? “Common sense,” he said. “That’s about all you need.” . . .
OK. This guy looks good on paper. . . . But it's easy to say that NYS is bankrupt and the legislature is dysfunctional. "Common sense" is certainly needed . . . It is a commodity in short supply in Albany. But one needs more than "common sense" to solve our self-inflicted problems, and thinking "that's about all you need" is not a good sign. Does Mr. Johnson really understand the Tea Party movement? Or is he just co-opting it for political gain? He will be in for a rude awakening if it is the latter. The last Republican endorsed candidate turned out to be a fake candidate or a sacrificial lamb. Hopefully that does not happen again. The only thing that would be worse is if he is an "insider" beholden to our policy-bankrupt Oneida County elite. Tea Party people are fed up with party labels and business as usual. Issues, hopefully, are what campaigns are going to come down to. If Mr. Johnson really wants to help this area, he will make himself thoroughly familiar with the issues. He will not accept what party bosses tell him, but make up his own mind after first seeking out and weighing facts on all sides of an issue . . . and he will be able to defend his positions in a logical manner with respect for opposing viewpoints . . . and he will be willing to change positions when shown to be wrong (no one expects perfection, and a bit of humility would be a welcome change). Time will tell if Mr. Johnson is the "real deal" . . . an "insider" . . . or just another fake candidate. We Need A Primary . . . The anointing of Mr. Joseph as the Republican candidate would not bode well for the voters or this area's future. He is one of the party insiders who have controlled things for too long. Look around you and you see the results of their work. Given the lack of a strong Democrat challenger, Mr. Joseph's candidacy would ensure that the incompetent incumbent leadership shown in the "rubber-stamp" Oneida County legislature would be extended to include incompetent representation in Albany. He must be stopped. How can I say this when I do not know Mr. Joseph personally? Check out this post from August 2008 on the process to find an FBO for Griffiss: How Bad Can It Get? . . . While the video interview is no longer available, enough of Mr. Joseph's responses were recorded to enable one to understand his thought processes. If the region's problems are ever going to be solved, we need people willing to respectfully consider opposing viewpoints and seriously account for opposing data. The "team" mentality must give way to thoughtful debate. After all . . . Managing our region's future isn't a game. What Our Founders Intended . . . Per the OD today, Utica visited again over religious pluralism . In a world of religious differences and sometimes strife, Utica is on the map as a place where multiple faiths are co-existing in relative harmony. In recent years, the city has become a stop for international journalists, religious experts and diplomats interested in how Uticans are managing a remarkable religious transition. While outsiders may scratch their heads in wonder, this all seems so natural to us. And it's not so hard to understand. Utica was built by waves of immigrants. While the countries they came from may have had different customs, and while their reasons for leaving may have been different, their reasons for coming here were all the same: to start over in a land where they were free to make their own way. Those memories linger in the family histories of the older Welsh, Irish, German, Italian, Polish, and Lebanese immigrants who came here. Over time these groups discovered what they had in common, and realized that they were not so different from each other. Now, the descendants of the older immigrants see their own family histories playing out again before their eyes in the Bosnians, Russians, Cambodians, Karen, etc. that have arrived recently. The memories are refreshed. The new arrivals are traveling down the same path to freedom that our grandparents took. They are like us, too, in what really counts: seeking freedom. It is only natural that we would want to show them the way. "Fixing" taxpayers is more like it. In an under-reported move (under-reported in that local news accounts left out a key fact) Sens. Griffo, Valesky and Seward voted in March to make it easier for school districts to increase spending when voters vote NO on local school budgets. It seems that with current economics and law, a NO vote would permit a 0% increase, but with the new proposal a 3% rise in local school spending would take place. New Hartford Online has all the details (scroll to "related story"). It's clear that these senators do not trust you, the voters, to do what is right for your local district. An Upstate Candidate for Gov? The Governor's race so far looks like Cuomo vs Lazio, which does not bode well for Upstate. Cuomo could be expected to govern like his father, which was a total disaster for us . . . and Lazio seemed not to even know where Upstate NY was when he ran against Hillary for US Senate. But from the Post Standard we hear about a new candidate -- from Buffalo: Paladino, running for governor, denounces 'ruling class' on visit to Syracuse. Carl Paladino brought his campaign for governor to Syracuse Wednesday, denouncing a “despicable ruling class of people who have lost sight of the people they represent.” . . .
Well, Mr. Paladino got our attention . . . but can he deliver? It's bad enough when government takes private properties for publicly owned projects. Just think of all the businesses that were simply removed from Downtown Utica for various arterial projects . . . probably enough to fill a shopping mall. And then there was "Urban Renewal" . . . . "Urban Removal" was more like it . . . Both proved that Government cannot make a city . . . but it sure can undo one . . .
Now comes the new twist in the wake of Kelo v New London . 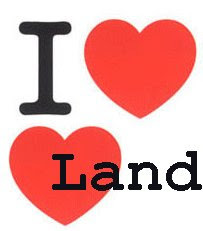 . . Big Government coming to the aid of Big Developers by using Eminent Domain in their behalf . . . all for alleged public "benefits" such as increasing the tax base. Of course, you'd expect such things to happen in New York City where Big Government is a way of life. . . . but Auburn??? Pioneer wants Auburn to take private properties so it can build a hotel and conference center. One can just imagine something like that happening in Utica. . . . a hard pressed Upstate city desperate for some economic activity . . . and local officials desperate to leave their "mark" . . . what an easy thing to do. . .
People in Auburn sense the wrongness of this and are protesting . . . but will their government listen? And will even their neighbors listen? Here are thoughts to ponder. private  corporation  or  association, or private undertaking . . .
Is it OK for Government to loan its power for the same private purpose? Downtowns take generations to develop. As nice as the Utica Radisson and surrounding "new" City Hall and Kennedy Plaza development is . . . it is nothing near the dense economic activity that they replaced. Downtown Utica, even when shabby, was still functioning when Urban Renewal and Government intervention destroyed it. Places like Auburn and Utica were not built by the government. They were built by individuals -- entrepreneurs -- who risked their own money in ventures. How many would be willing to take similar risks in the future if their hard work and vision can be taken from them by the government teaming up with a competitor? Fighting Kelo-like eminent domain actions may wind up creating more "public benefits" than a developer's flashy proposals. It's official: Greater Utica no longer part of the Central-Leatherstocking Region for New York State tourism. Instead, we're just part of "Central New York." I suppose it is better than "Central-Leatherstocking" . . . I could never understand using that name for the region (though I recognize the "Leatherstocking Tales" connection) . . . Think about it: They could have named the region "Central-Bloomers" (Utica was once the underwear capital of the world) or "Central-Baseball Cap" (for Cooperstown's Baseball Hall of Fame) or "Central-****kickers" (for farmers' boots) and it would have made as much sense. But just plain "Central" . . .??? “Central New York” is so cold and utilitarian. You would think with all the marketing savvy in this state they could have come up with something just a little warmer to describe our home. Something like . . .